Microsoft (s msft) co-founder Bill Gates has thoughts on a lot of things, from the demise of lecture halls to the awesomeness of the patent system. 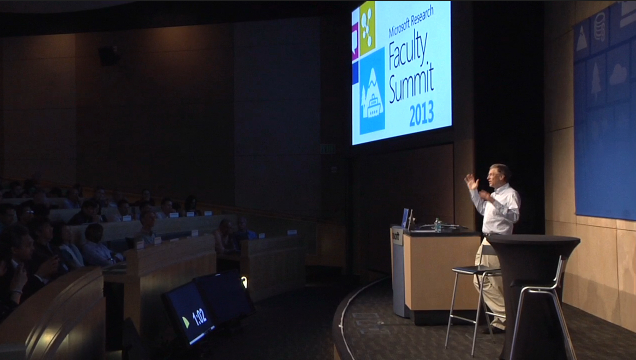 He took the stage at the company’s annual Faculty Summit — a two-day affair where researchers get together and talk about computer science — to answer questions from former Microsoft Research head (now part of the operating sytem team) Rick Rashid and the audience about all of them. Here are the highlights. Gates talked a lot about the issue throughout the Q&A session, and his hypothesis is simple: Education in the United States is broken — it has the highest higher-education dropout rate among rich countries — and MOOCs can help fix it. In fact, the Bill and Melinda Gates Foundation has invested a lot of money into the education field (to the chagrin of some experts), including strong support of Massive Open Online Course, or MOOC, startups such as the Khan Academy. Online courses can give students access to new areas of study that can align their skills with high-paying jobs. They can even help physical institutions personalize student learning through gathering data about attendance, engagement, real-time understanding of the subject matter and other things. They can give those few elite minds responsible for such great inventions even easier access to new knowledge. But, Gates acknowledged, we’re also a way out from online education achieving its full potential. We need to develop better understanding of what makes a good online course (“just sticking a camera in front of someone … who has a captive audience [won’t cut it]”) and how to replicate non-lecture experiences like lab time and study groups. We also need to figure out how to supplement the cognitive and social development that comes along with attending school in person (although, he noted, MOOCs might also be able to help teachers focus on these things). Gates told the audience we’re in a “golden age of computer science” thanks to the nearly limitless amounts of power and storage at our fingertips. Everything he talked about, from MOOCs to climate models to personal assistants, is benefiting from this and will continue to do so. 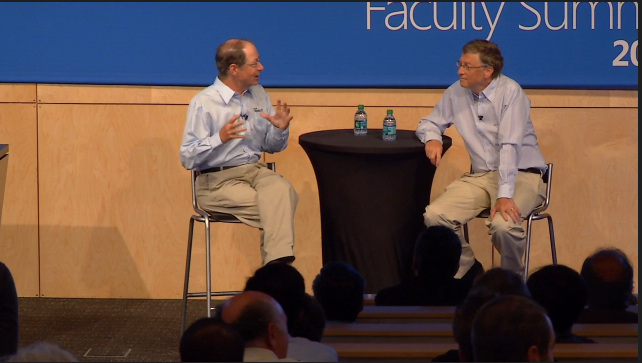 Consumers will also benefit, Gates told an audience member who asked about the gap between how computer scientists use computers to automate their lives and how most people don’t really know how to use them effectively. Yes, many people still don’t know how to use Office to its fullest potential (apparently, a little dog popping up with suggestions didn’t help, Gates joked) or perform efficient searches, but more data and more-powerful devices will let computers bridge the gap between what software can do and what its users can do. “As everyone gets, essentially, what we’ll call the personal agent … I think we will be more connected,” Gates said. However, he cautioned, the world of programming probably has to evolve if we’re going to accomplish some grander goals such as large, complex systems spanning entire industries. There are more programmers and they’re better than they were 10 or 20 years ago, but there is no objective metric by which someone could say the state of the art has significantly improved. Things have changed, Gates said, but there’s still serious work to do on knowledge representation and logic representation, among other things. An audience member asked Gates about a past prediction on the personal robot revolution and how that’s coming along. “The word ‘robot’ can be interpreted very broadly,” he replied. In some ways, we’re already seeing really advanced robots in the form of farming implements that can detect the difference between weeds and crops and apply herbicide accordingly to each individual plant. In 20 or 30 years, Gates predicted, maybe robots in remote areas without a lot of doctors will be able to perform C-sections. “We’re always on the verge of ‘When is the breakthrough going to happen? '” he said, and current advances around machine learning, image recognition and other things make it seem that will be sooner rather than later. Machine learning, big data and general advances in computer science have been great in certain areas — his foundation is doing much work with stochastic models around the spread and evolution of disease — but climate change is a tougher nut to crack, Gates explained. Climate models tend to be closely fitted to historical data, and it’s difficult to predict the effect of minor variations in systems as complex and multifaceted as ecosystems, oceans and forests. Still, there certainly are shining example of wealthy individuals willing to donate their money. Gates pointed to Warren Buffett, who contributed half of the Gates Foundation’s annual $4 billion budget, and the other billionaire members of the Giving Pledge that have promised to give the majority of their wealth to philanthropy. Even mega-yacht builder and Oracle CEO Larry Ellison is on that list. And interestingly, Gates said, rich individuals in China tend to be more generous with their money than those elsewhere because so much of that wealth is first-generation wealth. There aren’t ruling-class families who consider themselves dynasties, but rather people who recognize the ridiculousness of one person accumulating so much money so fast. Asked about the most-pressing problems in the world and the ones that scientists can best help solve, Gates pointed to nuclear and bioterrorism as the thing we most want to avoid — but not the world’ biggest problem. That, he said, is probably the “ongoing disaster” that is 7 million children a year dying. He took some credit for getting it down to this number from 20 million when he was a kid and 12 million when the Gates Foundation began, citing new vaccines as a major cause for the improvement. In several years, he predicted, the number of children dying each year should be down to 3 million. I congratulate Bill and Melinda Gates for their philanthropy both in the USA and in the rest of the world. Yes, of course. That’s like a king “thanking god” for serfdom. People who aren’t exploiters would be eager to adapt to a free market: a market without government force-backed limitations such as patents. Gates is delusional if he thinks there wouldn’t be more innovation and dollars pouring in, naturally, across a more diverse spectrum. The market would be 100x the broadness it is and hell of a lot more sustainable from decentralization (more people partaking in the market). That’s what free markets do: they level the playing field and competition and innovation is spurred as a result because, as it happens, millions of people enjoy researching, discovery, and creating. Patents oppress and undermine the entire economy. People, startups, and innovators don’t stand a chance unless they want to play dirty or have the funds to feed trolls. The culture of openness and freedom vs. government force and artificial economic restraints is clear. Only the former is natural and ethical. Patents are nothing but a “legal” (sort of like murdering people with drones is “legal”) method of plundering and welfare to big business. Large corporations love patents. They can afford to acquire everyone else’s patents, including the ones from the infinitesimally small percentage of “independent inventors.” They love it because it destroys small competition. It destroys the masses — the serfs — from partaking in trade. Patents are corporatist, big government ideology that go against everything natural and good about what would otherwise be free business, trade, and entrepreneurial passion. Actually, I beg to differ. The idea of intellectual property doesn’t hold much weight in China and China has a bad track record of innovation precisely because people know their ideas can easily be stolen. The one thing that Bill Gates did not discuss is our library’s in America and how he has helped them get computers which connected our communities. I remember a decade ago he promised computers in library’s and today there is proof. While we all understand how Steve Jobs gave Apple computers to education, which led to schools adopting Apple boxes more than windows boxes, it is library’s today that are dominated by Windows, thanks to Bill Gates. You see a few apples, but most public libraries are full of windows based computers. Libraries are the hub to our cityâ€™s and for those with no computer, the library allows a person to come in and use them just like the rest of us. Without a computer a person would find it hard to look for employment, and communicate with family and friends. You surely would not be reading and responding to this. In 2010, 77 million Americans got online using library computers. With that in mind it is clear how important libraries are for the future of connecting all American’s. Library Helpers is a great website. For schools to be successful one question needing an answer is, “Why would a kid WANT to return to my classroom day after day?” Another, “Why would I WANT to be a kid in my own classroom?” Another, “How does this teacher plan lessons which WILL appeal to the imaginations of kids with an IQ of 100 and for kids with an IQ of 120?” Does the lesson obviously appeal to the imagination of the teacher? How does one know? Doesn’t hold much weight as you’re more likely to outdo all others based on your active,hard work than on your IQ. Isn’t it nice Bill has educated himself somewhat on climate modeling. Should we celebrate and pay homage to Bill Gates because he went to school recently (like millions of other students on the planet who don’t get GigaOm articles written about them)? What he apparently said (with Derrick apparently paraphrasing) regarding how “its difficult to predict the effect of minor variations in systems as complex and multifaceted as ecosystems, oceans and forests” is nothing new. The recently late Edward N. Lorenz (a meteorologist and mathematician) figured out much of this many decades ago. Yet the young Derrick Harris (who might not have heard of or be familiar with Lorenz’s incredible contribution to humanity) thought it was important to steal a few slivers of his reader’s attention spans by tapping keys on his keyboard to inform us of Bill’s educational discovery on this subject. Sigh. Fair enough to point to Lorenz’s contributions. Although, I’m not sure they preclude Bill Gates from commenting, during a Q&A session, on the difficulties of using data to solve certain global concerns without paying homage. Astonishing hypocrisy considering he supports the abortion of millions of children every year. No, that’s not hypocrisy. Also, you can’t abort a child. And thank your mom, dad, and wife. Without them, who knows…?